Since Pokemon Breeding and Pokemon Abilities don't exist in this game, Pokemon Natures are all the more key. Pokemon Natures dictate what will be a Pokemon's best stat for overall potential, being random assigned to all Wild Pokemon. If your Pokemon, for example, has a Nature that is beneficial to its Attack Stat, said stat will have the potential to be higher than if it had a Nature that didn't boost (or even lowered) this stat. Most Natures tend to benefit one stat while lowering another, but there are a few that are neutral and boost/hinder no Stats whatsoever. Since Pokemon Natures are now all the more crucial, statistically speaking, players will need to try all the harder to capture Wild Pokemon with the best possible Nature for its overall growth. 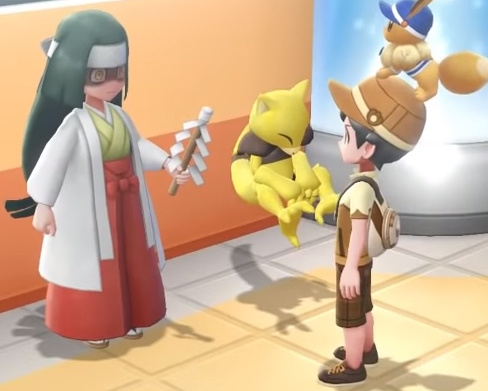 Luckily, there is a character found in the game called Madame Celadon, found in none other than the Celadon City PokeMart, who can help you manipulate the Natures of Wild Pokemon. This is the only known method of personally choosing what Natures the Pokemon you are hoping to capture will ultimately have within this game. For the price of $10,000, Madame Celadon will ask you what color of flower you would like to water. Depending on the color you choose, this will determine the beneficial stat for Wild Pokemon for the remainder of the day. She will then ask which color of flower you would like to thin out, and this will determine the hindered stat that goes along with Pokemon Natures. She will finish by telling you the Pokemon Nature you have selected to be prominently found in Wild Pokemon for that day; you can pay her daily to manipulate Wild Pokemon Natures. By choosing Red Flowers, this will boost/lower the Attack Stat of Wild Pokemon (depending of it you chose to water said color of flowers or decided to thin them out); by selecting Yellow Flowers, you will boost/lower the Defense Stat of Wild Pokemon; by going with Blue Flowers, you will boost/lower the Special Attack Stat of Wild Pokemon; by selecting Green Flowers, you will boost/lower the Special Defense Stat of Wild Pokemon; and finally, by choosing Pink Flowers, you will boost/lower the Speed Stat of Wild Pokemon for that given day.